Surah Fatiha is the first Surah of Holy Quran and the importance of it is known to just about every Muslim. Surah Fatiha is the most recited Surah of Quran as it is fardh (obligatory) to recite it in every rakah of five-times Salah. 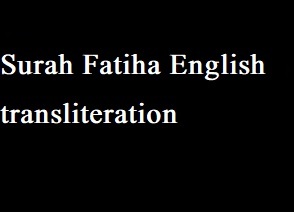 Keeping in the mind the importance and its benefits, I have included an English transliteration for brothers and sisters who are learning Quran from scratch. This is a very simple and easy-to-read transliteration. There are countless benefits of reciting Surah Fatiha. This Surah has another key benefit that most of the people are unaware of and that is its power to work as ruqya. If you or anyone is suffering from any kind of disease and illness, reciting Surah for it can work wonders for you. In addition to it, black magic, evil spirits and shaitan waswaas can be controlled with its recitation. If you have found this transliteration useful, which I hope you have, please try to share it widely. Moreover, if you have spotted any error in it or have suggestions for improvement, please inform me as I will be amending it accordingly.